Americas Best Value Inn Fort Wayne is conveniently located off of I-69 for easy on and off highway access. Our hotel offers 45 spacious guest rooms/ exterior corridors with park-at-door convenience/ jacuzzi suites/ free wireless high-speed Internet access/ and complimentary grab and go breakfast including honey buns-orange juice and coffee available. All guest rooms come equipped with microwaves/ mini-fridges/ hairdryers/ telephone/ free HBO/ and free local calls. Sofas are provided in some rooms. Pets are allowed/ charges apply. We are centrally located near many restaurants/ businesses/ shopping centers/ and Indiana University-Purdue University Fort Wayne. You will find plenty to see starting with the nationally acclaimed Childrens Zoo/ magnificent Botanical Gardens/ and award-winning Lincoln Museum. Sporting events with the Fort Wayne Komets hockey/ TinCaps baseball/ and Mad Ants basketball team will dazzle the crowds. Or you can catch a touring Broadway show. Enjoy plenty of festivals and events in the community. At Americas Best Value Inn Fort Wayne/ Weve Got You Covered from the time you hit the road until your head hits the pillow. 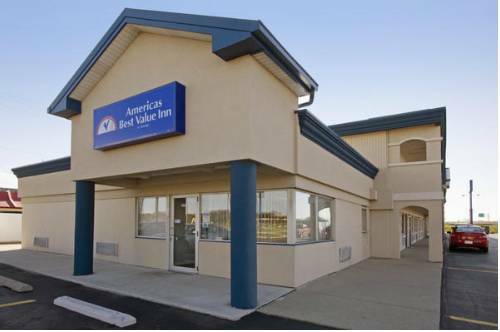 Americas Best Value Inn Fort Wayne is conveniently located off of I-69 Exit 111B. Our address is 1401 W. Washington Center Road/ Fort Wayne/ IN 46825. ~46 miles from Fort Wayne.